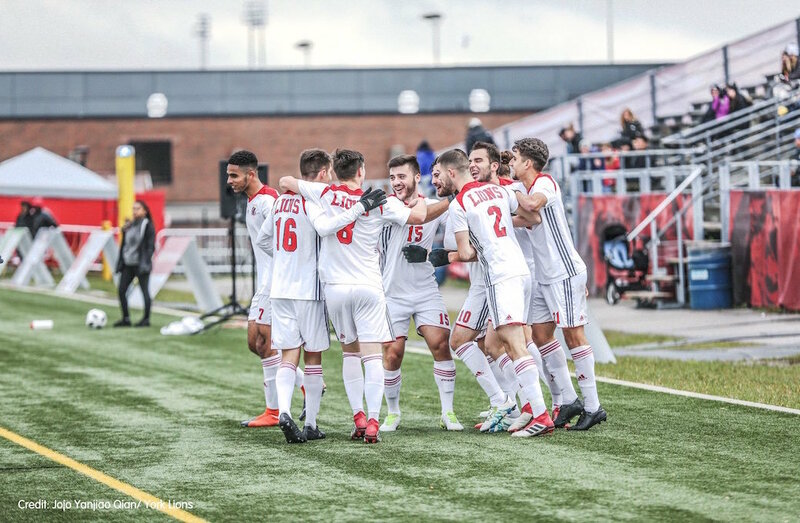 The OUA Final Four in men’s soccer saw some thrilling action involving highly-ranked teams, with the No. 2 York Lions eventually downing the No. 5 Ryerson Rams and No. 3 Carleton Ravens (who were hosting the event) to come out on top. Against Ryerson in Friday’s semifinal, York was held scoreless through the first half despite a 5-3 advantage in shots, but eventually capitalized in the 66th minute. That goal came from defender Josh Kiselyov, who capitalized after the Rams couldn’t clear the ball following a corner kick. That was only the second goal in Kiselyov’s three-year career with the Lions so far, and it combined with a shutout from keeper Mike Argyrides to give York a 1-0 win and send the Lions to their sixth straight OUA final. That final saw the Lions taking on the Ravens, who advanced there thanks to a 3-0 win over the Western Mustangs Friday. In that gold-medal match Saturday, York’s Maurizio Ragone scored in the third minute, and first-team OUA all-star Jorgo Nika expanded the lead to 2-0 in the 23rd minute with a nice header. Tristan St. Pierre struck back for the Ravens early in the second half, but Nika added his second of the match in the 79th minute, making a beautiful run to finish off a set piece pass from Dylan Carreiro. "We knew Carleton's offensive play and we tried to keep our composure and defensive shape. I had the opportunity to score two goals, but the win is the team's effort throughout the entire game." This also continued York’s impressive winning streak. The Lions went 13-0-3 this regular season, and their only loss since Aug. 30, 2017 was a loss to the Thompson Rivers Wolfpack in last year’s national quarterfinals. Next, they’ll be heading to to the U SPORTS national championships this coming weekend, which the Canada West champion UBC Thunderbirds will host. The other teams at nationals will be the Cape Breton Capers (the defending national champions and the top-ranked team for most of this year, who also won their third-straight AUS championship Sunday with a 2-0 victory over the UNB Reds), the Montreal Carabins (who claimed their second consecutive RSEQ title Friday with a 3-0 win over the UQAM Citadins), the AUS runner-up Reds, the OUA runner-up Ravens, the RSEQ runner-up Citadins, and the Canada West runner-up Trinity Western Spartans. Those championships begin Thursday with the quarterfinals, featuring the Lions against the Spartans, the Carabins against the Reds, the Capers against the Citadins and the Thunderbirds against the Ravens. The StFX X-Women continued their streak of winning a national title every other year since 2010, pulling off a 41-24 win over the Guelph Gryphons in Sunday’s gold-medal game at the Acadia University-hosted championships. Guelph went up 7-0 early in that game on a try from Julia Schell and a convert from Madison Brattan, and then later took a 14-7 lead. But the X-Women struck back with tries from Olivia DeMerchant and Amelia Hatfield, plus a convert from Danielle Franada, and StFX led 19-14 at the break. In the second half, a try from Sam Lake and a conversion from Franada put the X-Women up 26-14. An unconverted try from Guelph’s Rebecca Sundell closed the gap to 26-19, but Lake then scored again, and Franada made it 33-19. Franada then added a penalty kick to expand the lead to 36-19, and while the Gryphons managed a 71st-minute unconverted try from Brodie Schmidt to make it a little closer, Lake’s third try of the half in the final seconds created the 41-24 final score. X-Women flanker Hatfield was named the player of the game, and in an emotional interview afterwards, she said the moment hadn’t quite sunk in yet. StFX got to the final thanks to a 42-21 quarterfinal win over the Queen’s Gaels Thursday and a 26-12 semifinal win over the Laval Rouge et Or Friday. Meanwhile, Guelph beat the Victoria Vikes 54-10 in the quarterfinals Thursday and then edged the defending national champion Ottawa Gee-Gees 15-12 in the semifinals Friday. Ottawa wound up taking bronze with a 15-14 win over the Laval Rouge et Or Sunday, while Victoria topped Queen’s 24-15 in the fifth-place match. The Victoria Vikes claimed the Canada West championship and a berth in the best-of-three matches nationals two weeks ago despite a bye, advancing thanks to a better goal differential than the defending national champion UBC Thunderbirds. The Vikes hadn’t played in three weeks ahead of their national championship clashes with the host and OUA champion York Lions (who edged the Guelph Gryphons 1-0 in their own conference final last week), but they wound up not showing much rust; they started strong with a 2-1 victory in the first game of the series Friday, and then won their first McCrae Cup since 2008 with a 3-1 win in the second game Saturday. In the first game Friday, Vikes’ goalie Robin Fleming made two important early saves, stopping Prava Sandhu on a Jaslan Stirling feed 10 minutes in and then stopping Stirling herself six minutes later. Victoria then took the lead with four minutes left in the first half on a goal from rookie forward Erin Dawson. Stirling set up Amber Sandhu for the equalizer two minutes later and the teams entered the halftime break tied at one, but Dawson’s second goal with 11 minutes left in the game would prove the difference. GOAL! Erin Dawson! Victoria takes a 2-1 lead on York with 11 minutes left in the second half. In the second game Saturday, Stirling got the Lions off to a good start with an early chance that turned into a penalty corner. The Vikes were able to defend their net and then apply pressure of their own, though, and that paid off in the 14th minute when midfielder Lindsay Cole beat York keeper Alycia Gray. Fellow midfielder Stefanie Sajko scored on her own rebound a minute later to give Victoria a 2-0 lead at the half, and rookie Cara Butler added some insurance early on in the second half. GOAL! Cara Butler! Victoria takes a 3-0 lead on York with 29 minutes left in the second half. Sydney McFaul scored a late goal for the Lions in the final minute, but that proved too little, too late. In the end, the Vikes claimed their first championship since 2008, and head coach Lynne Beecroft cited the lessons they learned from that previous team afterwards. 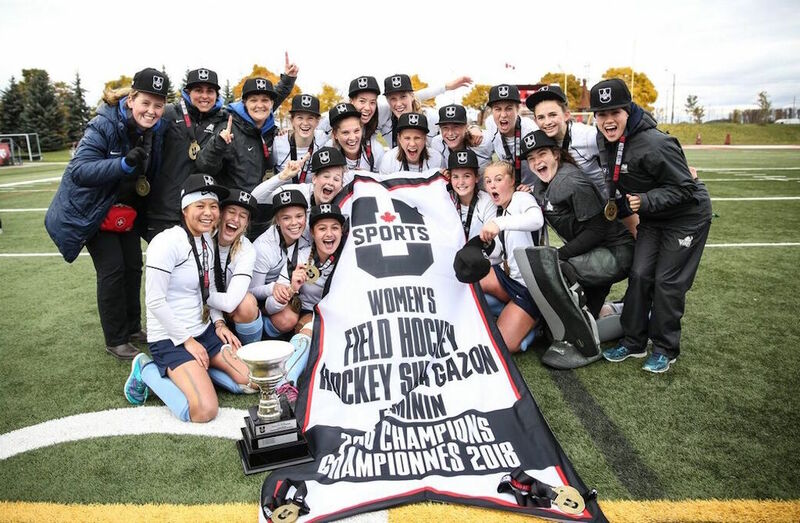 The Vikes’ win marked the eighth straight U SPORTS field hockey championship for a Canada West team, as the UBC Thunderbirds had won the previous seven. It was a special moment for Victoria, though, and a return to the top more than a decade in the making. It’s been a year to remember for Saskatchewan Huskies’ head coach Scott Flory. Flory, who played for the Huskies from 1994-98 before a long CFL career (which saw him inducted into the Canadian Football Hall of Fame this year) and helped them win the Vanier Cup in his final season, returned to the Huskies in 2014 as run game coordinator before eventually becoming offensive coordinator and then head coach ahead of the 2017 season after the offseason departure of Brian Towriss (who had led the Huskies since 1984). The Huskies went 2-6 in Flory’s debut season last year (after a 5-3 mark in Towriss’ final season), but improved dramatically this year, posting a 5-3 regular season record and then beating the UBC Thunderbirds 31-28 in overtime Saturday in the Canada West semifinals. Near the end of that game, it looked like it would be UBC moving on, as the Thunderbirds led by seven with just 51 seconds to play. But fifth-year Saskatchewan quarterback Kyle Siemens came through in the clutch, putting together a four-play drive that was capped with a 14-yard touchdown pass to Jesse Kuntz. Fifth-year kicker Sean Stenger tied the game on the convert. In overtime, the Huskies’ defence held on the first possession, shutting down the Thunderbirds on second down after giving up nine yards on first down. That forced UBC to attempt a field goal, and kicker Greg Hutchins put that wide right. That paved the way for Stenger, the Huskies’ career scoring leader. After two Tyler Chow rushes earned Saskatchewan nine yards, Stenger drilled a field goal to send the Huskies back to the Hardy Cup. "UBC is such a talented football team, our guys just played so well as a team. We were connected top to bottom, from special teams to offence to defence. As it turns out we just made one more play in the end. I'm just so proud of our guys." For the eighth year in a row, the Trinity Western Spartans’ women’s soccer team made it to the Canada West final, and for the second year in a row, they came out on top. A 12-2-0 regular season saw TWU on top of the Top 10 rankings for a fair bit of this season (splitting time in first with the defending champion Montreal Carabins), and they’ve lived up to that ranking in the playoffs so far. However, they didn’t have an easy path to the conference title. In last week’s Canada West quarterfinals, the UFV Cascades took TWU to overtime before Spartans’ striker Rachel Hutchinson came off the bench and scored the only goal of the match in the 107th minute. That sent Trinity Western through to the Canada West Final Four, which they hosted thanks to their regular season success, but they still faced a rocky road. In the semifinals Friday, the Spartans scored three quick goals in the first 12 minutes against the Alberta Pandas (with Kathryn Harvey, Elizabeth Hicks and Hutchinson accounting for those tallies), but conceded two in the second half to make things close. And in the final Saturday, Hutchinson scored what would prove the only goal of the match six minutes in, but TWU still had to survive plenty of pressure. Fifth-year keeper Rachel Sydor wound up making six saves in the victory. The Spartans are now headed to the national championships, hosted by the Ottawa Gee-Gees and beginning this Thursday. The other teams there will be the RSEQ champion Carabins, the AUS champion Cape Breton Capers, the host and OUA champion Gee-Gees, the Canada West runner-up Dinos, the RSEQ runner-up Laval Rouge et Or, the OUA runner-up Western Mustangs, and the OUA bronze medalist McMaster Marauders. The quarterfinals Thursday will see Cape Breton against Western, Trinity Western against Laval, Montreal against McMaster and Ottawa against Calgary. Free throws for free pizza? Now that’s a great promotion to win.